I not only like to visit this gallery regularly because it is kind of my neighbour at work, but also for its great photo exhibitions,. 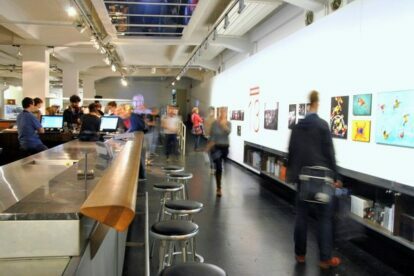 WestLicht offers quite a lot: it’s an exhibition hall, a museum for photo cameras, a bookshop. And in the tiny café area you can enjoy a drink while browsing through magazines and books. What I like is the simple yet stylish setting – this is no posh made-up gallery where you feel uncomfortable when you don’t dress smart enough. But a place with a perfectly balanced size for an exhibition: not too small so you get bored quickly, not too big where you’re overwhelmed by too many objects. The hall is located in a backyard, a loft in an industrial building from the ’50s. Here WestLicht shows exhibitions with very different topics. Award winners of World Press Photo are shown yearly, but you can also see small exhibitions of photographs dealing in very special contents like Skateboarding. The work of famous photographers such as Thomas Hoepker or Alexander Rodtschenko are presented as well as newcomers. A nice mixture – so check out their website to see if the current exhibition is what you are into. And then pop in!